Ethiopia Grapples With The Aftermath Of A Deadly Weekend : Parallels Amnesty International says 97 were killed when soldiers shot peaceful protesters in different parts of the country. Protesters have various grievances, but all share frustration with the government. Protesters chant slogans at a demonstration in Ethiopia's capital, Addis Ababa, on Aug. 6. Demonstrations took place last weekend across the country, and Amnesty International says dozens of peaceful protesters were shot dead. The videos trickled out slowly on social media — slowly, because those posting them had to use special software to get around what seemed to be a government-imposed internet block. This video showed thousands of people in the streets of the northern Ethiopian town of Gondar. The size of the crowd was significant in a country where civil protests are usually banned. Even more significant? The location o f this anti-government protest. 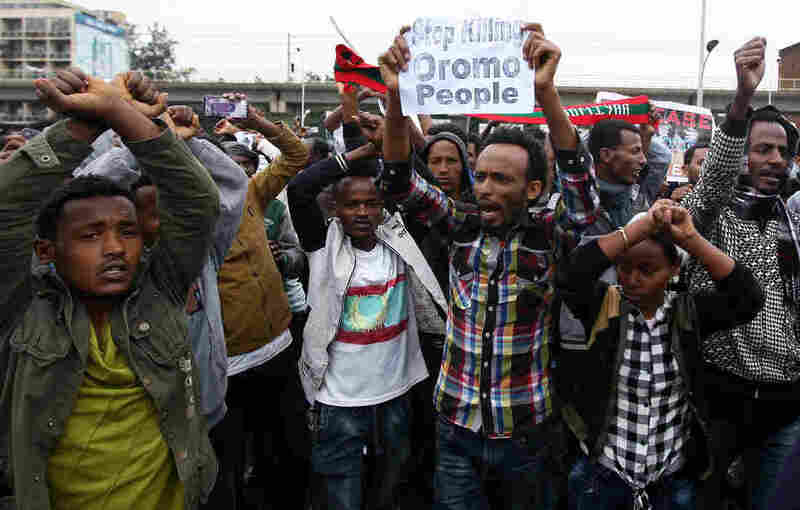 For the last nine months, protests have erupted further south, in Oromiya, home to Ethiopia's largest but historically marginalized ethnic group, the Oromo. But now the protests have spread north to a second region, the Amhara. The different protesters have different grievances, but they share a growing frustration with the rule of a third, minority ethnic group — the Tigrayans. They say the Tigrayan elite has a cartel-like grip on the government, military and the fast-growing economy. The response by the Ethiopian military to the protesters was swift and brutal. Amnesty International says that nearly 100 people were killed over the weekend when soldiers fired directly on demonstrators. The U.N. human rights chief has "urge[d] the government to allow access for international observers" to investigate what happened. Even after those weekend confrontations, witness reports were still filtering back to Addis Ababa, the capital. "We're hearing who's been wounded, who's in hospital, who's been killed, not to mention those who've disappeared without a trace," said Tsedale Lemma, editor in chief of Addis Standard, one of the few Ethiopian magazines that risks open critiques of the government. She described an Orwellian spectacle on state-run television, with "ferocious PR work" to discredit the protests. "People are being paraded in the TV, being made to denounce the protests. People denouncing even the use of Facebook." For years, Ethiopia's government has warned against a social media-fueled uprising like the one that happened just north, in Egypt, in 2011. If you watch Ethiopia's state TV broadcasts, what you'll be told is that the country's protests are fueled by ethnic separatists — or even ethnic terrorists. Tsedale disputes this explanation, saying the protesters' beef is with the government, not with any particular ethnic group. "I don't see that people are deliberately orchestrating ethnic violence in the country," she says. "Of course, the government is eager to identify it as such." In Ethiopia, politics is ethnicity, and ethnicity is geography. The country is formally divided into autonomous ethnic states, each with its own ethnic government. It's a controversial system called "ethnic federalism" that was instituted by the current regime. Political parties are organized along ethnic lines. Thus any critique of the central government will automatically take on ethnic dimensions. The protesters impugn the Tigrayan elite — the government officials and army generals — who, they say, have a choke-hold on the country. The government accuses the protesters of fomenting ethnic war on all Tigrayans, rich and poor. And in the fragile ethnic balance that is Ethiopia, the battle to claim the narrative is just as important as the battle in the streets.